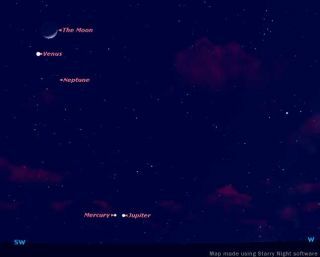 SKY MAP: The sky from mid-northern latitudes at around 6:30 p.m. local time on Dec. 31, 2008. The best time will vary by location: Go out at or just before sunset and watch for all these objects as the sky begins to darken. Mercury will be the last to appear and the hardest to spot before it sets. Neptune's location is also shown, but it's visible only through a telescope. All the planets, along with the moon and sun, traverse an arc across our sky called the ecliptic, which corresponds to the plane in space that they all roughly share. For this reason, you could draw an imaginary line from the general location of Venus and the moon, down through the other two planets, and the line would point to where the sun went down. This line could also initially help you find Jupiter and Mercury. Weather permitting, you can get a preview of the sky show on Tuesday, Dec. 30. On this evening, the planets will be in nearly the same place they'll be on Dec. 31, but the moon will be midway between Venus and the Mercury-Jupiter pairing. Venus is so bright you can see it during daylight if you know where to look. Given Venus' proximity to the moon on New Year's Eve, this would be an excellent moment -- just before sunset -- to use the moon to help you find Venus and gain bragging rights for being one of the few people to be able to claim seeing more than one planet during the daytime (Earth being the other one).